Have a Slice of Pie: This Blog Is Now 2 Years Old. To wish this blog a “Happy 2nd Birthday,” I’ve added a “Popular Posts” section — you’ll see a link, above. Commemorating the blog’s first birthday, I posted a list of “Greatest Hits” from the first year. This year, I would instead like to offer a glimpse into the future. I have many more ideas for blog posts than I have time to write those posts. So,… here are a few I’d like to write in the blog’s third year. 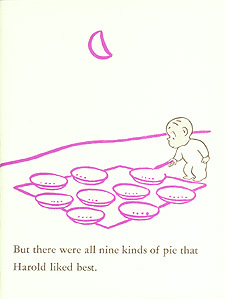 The Purple Crayon’s Legacy, Part II: Picture Books. I posted Part I well nearly two years ago. Part II is long overdue…. Mix for the Biography of Crockett Johnson and Ruth Krauss. In celebration of Crockett Johnson and Ruth Krauss: How an Unlikely Couple Found Love, Dodged the FBI, and Transformed Children’s Literature (to be published Sept. 1st!). Fear of Flying. A post that will not include the word “zipless,” but will address how to manage anxiety at 18,000 feet. Gollies, Scriptive Things, and Childhood Play. Inspired by both Robin Bernstein’s Racial Innocence and my own childhood, this post will serve as a rough draft of the introduction (or, really, part of the introduction) to a book I’m writing. Who Is the Dr. Seuss of Today? I often get asked this question. I have some answers. Barbara Lehman, master of the wordless picture book. I love her work, and have been meaning to write about her since this blog began. The newspaper PM. I want to scan in and post an entire issue of this paper, which was published in New York from 1940 to 1948. (I have a few copies of it.) It’s a beautifully laid out, Popular Front newspaper that ran Crockett Johnson’s Barnaby and the political cartoons of Dr. Seuss. This project may sound unmanageable, but the paper was printed in tabloid format, and each issue wasn’t that long. (It’s not like scanning in a copy of The New York Times). And there are several more for which I don’t have titles yet. Thanks to all (both?) of you for continuing to read the blog. I’ll continue to try to make it worth your time. Can’t wait to read these, Phil. And I’m especially eager to hear what you have to say about the Golliwogg. When I started the project that became Racial Innocence, I thought there would be a full chapter on the Golliwogg. That chapter turned into the one on Raggedy Ann, so I never wrote more than a couple paragraphs about the Golliwogg. But there’s a lot to say, and no one better to say it than you! Thank you, both! And, Robin, I’m sure you’re more articulate on this subject than I am… but I’ll do my best! My sense is that the entire post (which I anticipate being of some length) will turn into nothing more than a couple of paragraphs in my book’s intro. But … we’ll see! Barbara Lehman! Yes, lots on Barbara Lehman! She doesn’t nearly get enough attention. I went from knowing absolutely nothing about her to reading one book and falling completely in love. How does one of my favorite illustrators ever get so little attention? I can’t wait to see your post on the subject. I concur about Barbara Lehman! As a teacher, her books were excellent to use in reading lessons. Best tool ever for teaching visual literacy and inferencing.